Recipe by Naiya Sheth: Must heard about sabji Palak Paneer, but this is a new combination of palak paneer in the form of pakoda. Actually this is a rich,cheesy and delicious version of methi pakoda. It can be little bit easy to handle for new comers. I tried to add all possible green leafy vegetables for healthier recipe. 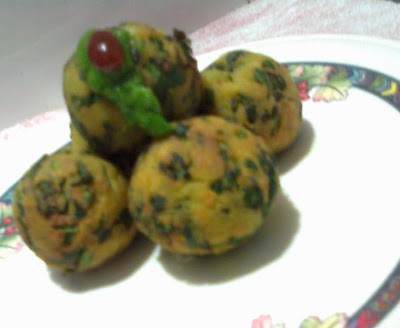 So try this super delicious snack Palakh Paneer Pakoda as starter or any time snack. 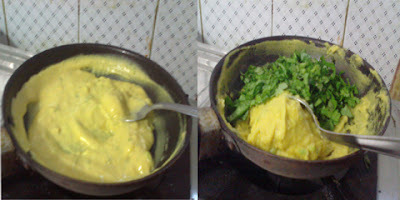 In a mixing bowl add besan, curd, salt, turmeric powder,water and green chilly. Churn properly. 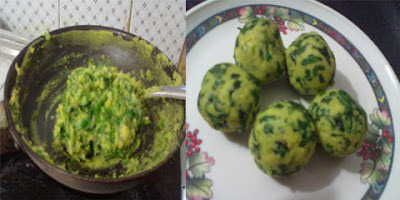 In a non stick pan pore above mixture and cook till it is lumpy. When ready add methi, palak and coriander to it when it is hot. Mix well and let it cool at room temperature. when cool make equal portion and then stuff with stuffing. Make proper balls from it. Take some oil on hands if needed. Fry them in hot oil till light brown in colour. Hot, cheesy and delicious Palak Paneer Pakoda is ready to serve. Serve it with tomato ketch up and green chutney.